It’s one thing to make mistakes in leadership. It’s another to make the same mistakes over and over again. Any idea what your frequent mistakes might be? And if you have mistakes that you make, why do you keep making the same ones over and over again? One of the reasons many leaders and organizations repeatedly make the same mistakes is because our actions spring from our viewpoint, viewpoints that in fact may be wrong. Get the viewpoint wrong and the actions follow. What we do in the church doesn’t really matter. The reality is nothing could be further from the truth. What we do in the church matters incredibly, because the church actually is, as Bill Hybels says, the hope of the world. If the church has the most important mission on earth, behave like it. But so many churches don’t. Here are 5 mistakes I see over and over again. Too often in church, leaders carry a dollar store mindset. Get as much as you can for as little as you can and you win. What leaders miss is that cheap has a cost. In fact, in the long run, it’s actually more expensive. First, you end up with inferior products, whether that’s furniture, technology or even ministry (Here, leader…do world class children’s ministry on $140 a year). Cheap things break earlier and more easily, and you end up replacing them frequently. So often, you don’t even save much money. Cheap even translates to team. Paying church staff poorly is not only unbiblical, it’s stupid. When you pay peanuts, you get monkeys. Do I think you should pay outrageous salaries to church leaders? Absolutely not. But you should pay people a living wage. If you want a radically different view on why non-profits shouldn’t be cheap on salaries, Dan Pallotta makes a powerful case for decent pay in the non-profit sector. Why do some church leaders want to underfund the most important ministry on earth? I’ve been to numerous church services and events that regularly start late, after the published start time. Some people got their kids up early, made breakfast, showered quickly and fought traffic to show up on time. When you start late, you dishonour all their effort. I know some church leaders think they want to wait until ‘everyone is here.’ Well guess what? No matter what time you begin, people will always wander in late. We had an ‘everyone shows up ten minutes late’ problem a few years ago. Rather than start late, we actually told people to arrive on time and then put some of the best, most creative elements in the first 5 minutes of the service. When people showed up late, we told them “Man, it’s too bad you missed it.” That was it. We never apologized. Guess what happened? We went from 30% of people being present when the service started to about 70% of people being present when the service started. It’s amazing what happens when you provide great value on time. People show up. The other 30%? Too bad they missed it…. Even if you invest some money in ministry, too many church leaders behave as though a moderate effort is good enough. As Jim Collins has famously pointed out, bad is not the enemy of great (because that’s obvious). Good is the enemy of great. A ‘good enough’ attitude can create a false sense of satisfaction, leaving a meaningful part of both your mission and potential unfulfilled. God didn’t decide his work was good enough, so why should the church? He gave his best. His all. He threw the full force of his majesty not just into creation, but into redemption. Strangely, many people will give 100% to the marketplace, a hobby or their family, and then give 60% when they serve God. Makes no sense. At all. Being effective as a leader is difficult. Which is why it’s so easy for leaders to settle when so much more is possible. Being effective means you dig in when others retreat. It means you ask the 11th question when everyone else stopped at ten. It means you wake up early and sometimes stay up late trying to figure out how to do better. It means you call out the best in people and ask them to bring their best energy, focus and skill to advancing the mission of the church. And it’s not easy. But it’s worth it. Some leaders understand why conversations like these matter to the church. But there are always some who don’t. In some circles, talking strategy is seen as ‘unspiritual.’ Instead, the goal is to not get too concerned with strategy and just try to keep everybody happy. Or to pray about things and maybe they’ll just get better. The best prayer is rooted in action. Praying about forgiveness when you’re unwilling to forgive is pointless. Praying for your church if you’re unwilling to act on it doesn’t make any sense either. If we believe God is the author of our hearts, minds, souls, strength and gifts, then we should be willing to lend all of the above to further the mission. I outline 7 other key issues the church needs to tackle in my latest book, Lasting Impact: 7 Powerful Conversations That Will Help Your Church Grow. 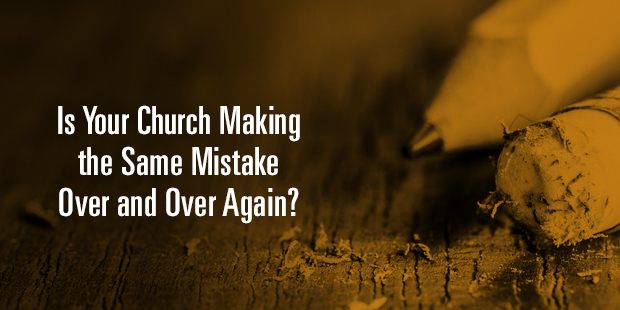 In the meantime, I’d love to know some of the mistakes you see churches make again and again. Auxano can help you get things done. Find out more about our Execution consulting service.